For the first time in the short history of The Midnight Tracker, we have the other side of an album for you. 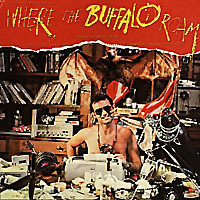 Last month, we fulfilled the Hose’s somewhat inexplicable request for the soundtrack to “Where the Buffalo Roam,” the 1980 film with Bill Murray as gonzo journalist Hunter S. Thompson. We offered Side 1. Tonight, for the Hose, for all you Neil Young completists and for all you fans of bad cinema, we have Side 2. As noted last time, Young contributed seven cuts to the soundtrack, all riffs and variations on “Home on the Range.” Young and David Blumberg also did the orchestral arrangements. The rest of the soundtrack consists of what even then were classic rock tunes. “Straight Answers,” “Highway 61,” “I Can’t Help Myself (Sugar Pie Honey Bunch),” “Ode to Wild Bill #3 With Dialogue,” “Keep On Chooglin’,” “Ode to Wild Bill #4,” “Purple Haze” and “Buffalo Stomp Reprise,” various artists, from “Where the Buffalo Roam” soundtrack. It runs 19:38. The soundtrack is out of print. Also, apparently only the VHS release of the film has the original soundtrack. Later DVD releases substitute sound-alike tracks for all artists but Neil Young.